Bashing Back: Wayne Besen on GLBT People, Politics & Culture is a compilation of 72 columns from the outspoken GLBT activist and author of Anything But Straight: Unmasking the Scandals and Lies Behind the Ex-Gay Myth. Funny, provocative, and informative, this unique book puts a progressive spin on hot-button topics in the political, cultural, and social arenas, covering everything from AIDS and African-Americans to Zach Stark. Bashing Back presents an A-to-Z look at Besen's worldview on a wide range of topics, including Bill O'Reilly, Brokeback Mountain, Ellen DeGeneres, gay pride parades, marriage rights, Mary Cheney, overhauling the gay movement, religion and politics, sports and homophobia, The Passion of the Christ, the pitiful state of TV news, the Vatican's war on gays, the World Trade Center, and New Orleans. Smart and funny, Besen delivers a knockout punch to the notion that liberalism stands for nothing and progressive means passive. Once upon a time I actually enjoyed The O'Reilly Factor. While I almost always disagreed with him, he was at least entertaining. Lately, however, he has morphed into just another Bush mouthpiece. The master of the “No Spin Zone” is suddenly spinning so hard he is in the Twilight Zone, dizzy in his own deception. He even had the audacity on CNBC to suggest that Fox isn't a conservative news outlet. That's beyond spin. If it were closer to Hanukah I'd think O'Reilly was a dreidel. My other problem with his show is that it's unnaturally obsessed with gay issues. More gay people appear on The O'Reilly Factor than on Showtime's Queer as Folk. I know that sounds strange coming from a gay columnist who has twice appeared on his show. But it seems like he's had on every gay person in America to use as his personal political piñata. When even gay activists are tired of watching gay segments, it's time to find a new culture war issue. 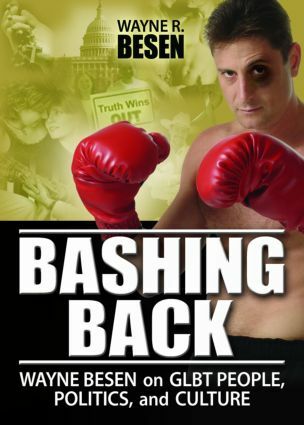 Bashing Back is an invaluable compilation of Besen's best columns from Planet Out, Gay.com, and the Washington Blade. It's an essential resource for longtime Besen readers and an entertaining introduction for newcomers.